The term “gamification” describes the use of game mechanics, such as challenges, achievements and rewards, to drive certain consumer behaviours in what are traditionally non-gaming contexts. Currently there are more than half a billion people worldwide playing computer and video games for at least an hour a day. That number is increasing with the growing adoption of smartphones and tablets. Psychologists and sociologists are only now beginning to understand why the human ability to play is so powerful. More than just a marketing gimmick, gamification has the potential to inject new life into a variety of industries and broaden the appeal of many new and existing offerings. Differentiate offerings from those of competitors. Gamification captures people’s attention but also heightens engagement, introducing fun into routine or boring activities. If you use social networks you can build buzz around a specific offering and attract broader, more engaged audiences. Have you heard of Foursquare? It’s a type of gamification. Through the Foursquare app, retailers can reward consumers who check in at a physical location and can promote offers and encourage repeat visits. Foursquare users get new badges and awards. Gamification is not to be mixed up with loyalty programs. Not all loyalty programs have gamification elements. These programs have no challenges, competitions, badges or other key aspects of games that would encourage users to do anything apart from make simple purchase transactions. Airlines have built some gamification into their frequent-flyer programs as they reward their best customers with elite status at certain earning levels. But most of them aren’t exactly fun or engaging. They rarely offer challenges, competition with other players or an active community that allows people to compare their statuses and compete with each other. Wasted opportunity? Applying gamification to education can make learning more enjoyable and ultimately more effective. For years, instructors have used the principles of success tracking (grades) and positive reinforcement via recognition, achievement, and rewards to motivate students; these are tools that are common to successful gamification programs. 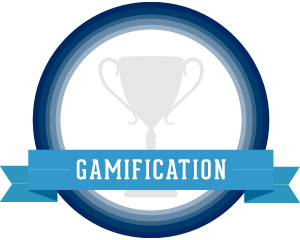 Gamification can also be applied to adult education, particularly to help with job-training effectiveness. Companies can promote specific behaviours and deliver rewards to employees who achieve results. Health-related gamification encourage good habits while discouraging or stopping bad or addictive habits, based on behavioural change theories that recommend engagement with timely, positive feedback loops to reinforce good behavioural changes. Gamification strategies will apply across many industries, leveraging cloud-based platforms and mobile apps to achieve the greatest possible reach. The potential benefits include improvements to brand perception, explanations of the benefits of complicated products, improvements in sales numbers, an increase in margins, driving customers to particular points of sale, and incenting referrals. As this market area develops, consumers will become much more selective about the programs in which they participate, forcing developers and brands either to simplify their programs in order to achieve the broadest possible adoption or to refine their strategies to have more targeted appeal among specific, well-defined segments. One of the things that’s really powerful about video games is the level of connection between how hard you work and the feedback you receive for your behaviour. Games are immediately rewarding, providing instant feedback when we do something right, and telling us how well we perform every step along the way. When used properly, games have the potential to offer experiences that engage people’s minds both cognitively and socially, and ultimately make us feel like an active participant in whatever we’re doing.